Frankly, I’m just not that sure about flavoured beers. As I say that, no doubt you’ll instantly think of those "girly" berry varieties – e.g. Liefmans and Bacchus – which, whilst still having a decent ABV, generally get a bit over-sweet by the time you reach the end of the bottle. They lure you in with their fresh and fruity promises, then spit you back out the other side with a red stained mouth, teeth included. It’s a bit like those days as a kid, when you drank way too much cherryade and came home hyperactive, with a perfect rosy circle on your upper lip - you literally had it written all over your face and there really was no hiding it from your parents. Well, not being one to rule things out, I thought I’d give them another go, or at least scout out some alternatives. Curiosity always gets the better of me.. So, after perusing the shelves of my local indie beer shop (Favourite Beers, Cheltenham), I picked out three varieties, all with pretty unusual flavours – for beer anyway. This 'Exotic Beer' from Belgium is like no other - the bottle looks a bit of an eyesore, and it just sounds plain wrong (it also informs you that you can buy a specially made coconut cup to drink it out of - hmm). 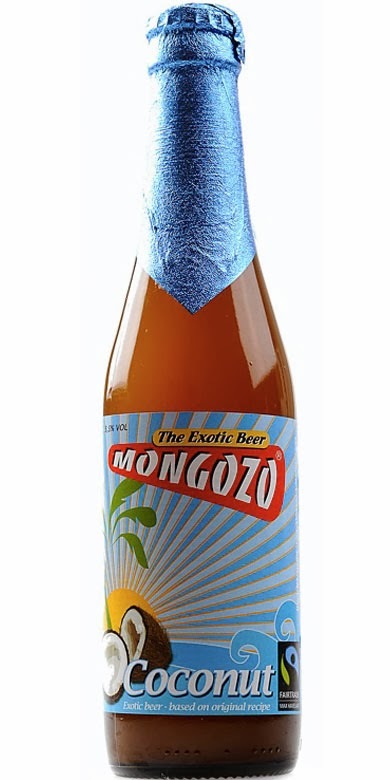 Mongozo is a white beer with a sweet, desiccated coconut aroma, and despite it fizzing up upon opening, it's not very carbonated. The first few sips are a serious coconut overload – I wonder whether this is what Malibu and beer would taste like together? You get a beery aftertaste, which gets more prominent the more you drink, and the shock of the unexpected flavour fades swiftly. Product info suggests this would be good to have with a curry or an ice cream, though personally, I think it is best on its own. It had the potential to be gross, but it is actually quite enjoyable, and I'd be willing to try the other flavours in the range - banana anyone? 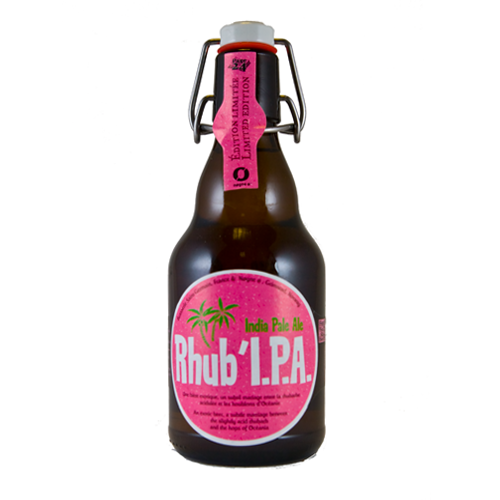 This rhubarb flavoured IPA is a collaboration between the French Brasserie Saint-Germain and Norwegian Nøgne Ø. Nice flip top bottle, check; jazzy label, check; though I'm not sure that palm trees really fit in with the idea of rhubarb..? It pours a light golden colour, with a decent creamy head. I couldn't smell much in the way of rhubarb, it was just very hoppy with a bit of sourness, which I guess is the fruit (or technically, the vegetable). Taste wise, the strength of the IPA seems to overpower the 'flavour', and I'd liken it to a Saison style beer. I think I had too high hopes for this one, especially as it was the most expensive; I dreamed of rhubarb and custard, but got a sharp, more complex taste instead. It would go nicely with a strong hard cheese and fruity accompaniments. 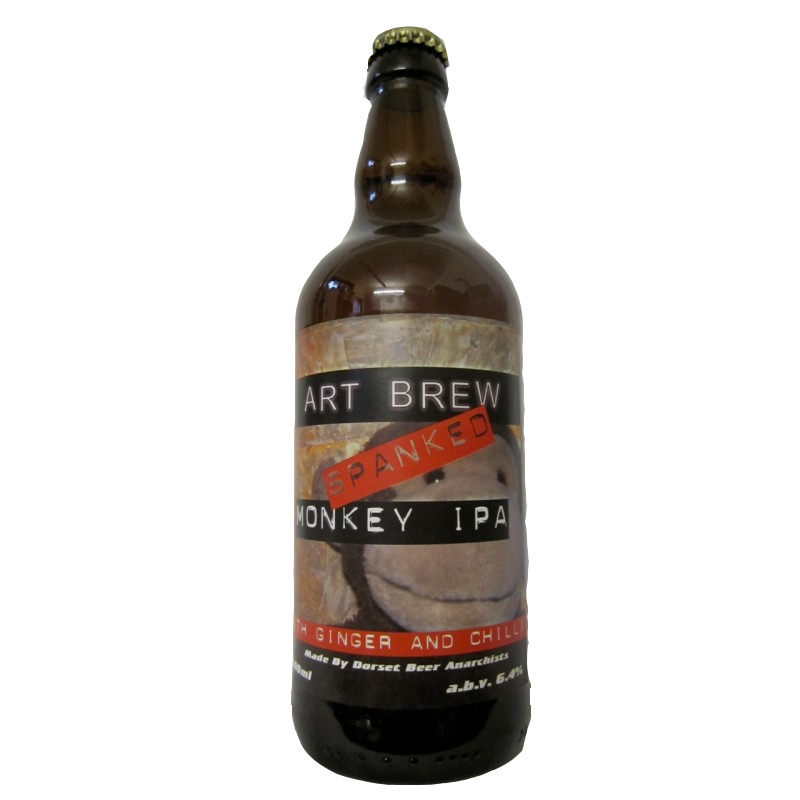 Ginger and chilli have been added to the cask of Art Brew’s original Monkey IPA, so it’s an infusion, as opposed to being flavoured. It's a much richer golden colour in comparison to the others, and has a definite ginger aroma, though there's something elderflower-y about it too. You can really taste the fresh ginger, and there's a good chilli kick that follows, which, overall, leaves a peppery finish. Maybe I've been looking at flavoured beers all wrong - they’re not the same as your average drink with which you could slurp one after another quite contently. They’re more like a ‘one off’ - a single afternoon beverage or a good midweek drink that (probably) won't escalate into a hangover the next day – and, with this view, I’m much more open to drinking them. 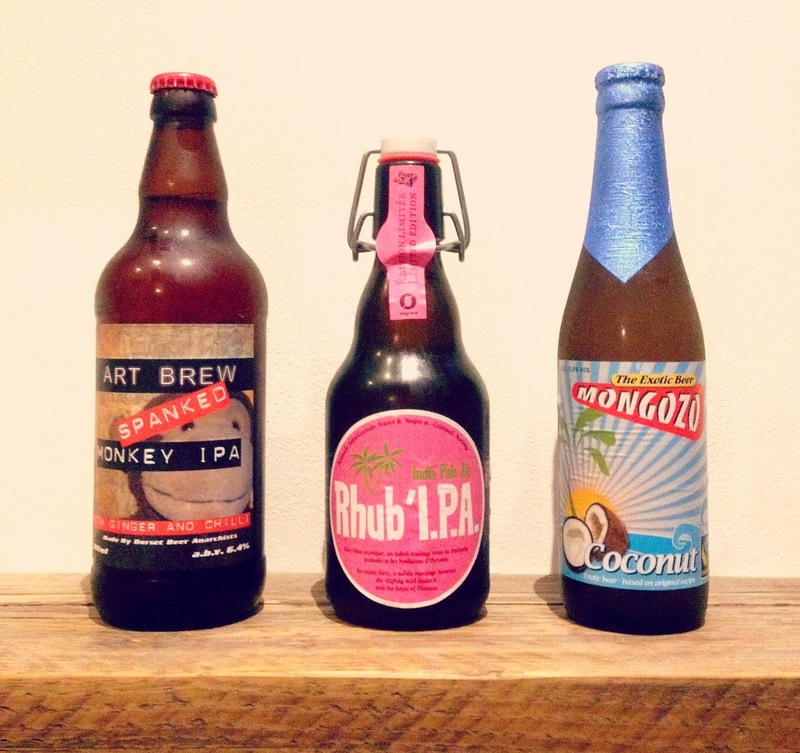 So, with Valentines Day happening at the end of the week - yes, this is a heads up for you forgetful folk - perhaps you could buy your special someone something different this year - a selection of flavoured beers? Be bold and go for the unusual; it will make the drinking experience more exciting and more of an event. Have you tried these, or any other unusual flavours? Let us know! Ilkley did a nice little rhubarb saison called Siberia, which was decent. My favourite 'flavoured' beer is Cantillon Rose de Gambrinus, which is a gueuze with raspberries in it. Too good for words, it's so sour! That sounds delicious! I shall have to check that one out. Friday Cocktail: OMFG, Disney Cocktails! Do We Pay Too Much Attention to Wine Trends? Win! We Have Two Corkcicles To Give Away! Wine and Food: What Wines Go With Spicy Food?